As a current university student with a love for logic, problem-solving, and math, Isaac wanted to develop his growing interest in fintech and data science. So he chose to attend Byte Academy’s full stack Python course in New York City during his summer break. And get this – Isaac has recently landed a data science internship at Facebook in London! Learn about the Byte Academy application process, the differences between learning at a bootcamp vs university, and Isaac’s tips for landing an internship at a top tech company like Facebook! Protip: Byte Academy's next Summer bootcamps kick-off June 18 and July 16. What is your pre-bootcamp story? What is your educational background? I’m currently in my last year studying for a degree in mathematics at UCL in London. I wasn’t sure what I wanted to do in my career, but I liked the logical, problem-solving aspect of math. And I'm rubbish with writing essays! Prior to going to Byte Academy, I was all over the place when thinking about what I wanted to do with my life. I’ve interned and done side projects in fashion, music, and consulting. I knew I liked strategy and problem-solving, but I didn’t know how to apply that. 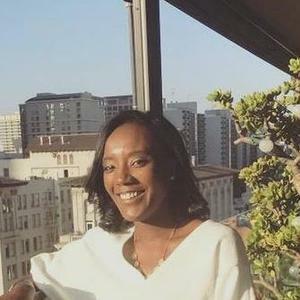 In London, finance and investments are big magnets, so I even did internships at BlackRock and Lazard, but I realized I wanted a role where I could be more creative and produce more sustainable work. After studying math and working in finance, what inspired you to want to learn software development? When I learned about fintech, I realized that it merged my skills in finance with technology. I was really interested in fintech because I saw small groups of people trying to tackle outdated and traditional ideas using technology to make better and more efficient products. Different sectors in fintech – trading, the retail space, cryptocurrency – all seemed to be very exciting. I learned about fintech at university, but I really didn’t have the technical skills. I’ve always had a passion for entrepreneurship, so it was frustrating to realize that I’d always rely on others for their technology skills. Picking up technical skills sounded like a fantastic opportunity. I tried to learn Python on my own with Codecademy, but it’s hard to motivate yourself. Did you ever take computer science courses or consider getting your degree in Computer Science? I attended Byte Academy in New York City during the summer of my second year at university. My first two years at university were limited in terms of the electives I could take, but I did take a few programming courses covering Python, Java and Mathematica. What was important to you when researching bootcamps? What stood out about Byte Academy? I was more interested in a bootcamp that taught the scientific and mathematical programming side of software development by covering languages like Python and NumPy. I didn’t want to solely learn theory, but I wanted a more algorithmic-based and data-based curriculum. What I liked about Byte Academy was that it was project-based and vocation-based, so industry leaders taught topics that were relevant and up-and-coming in the tech space. When I was doing my research, I saw that Byte Academy taught courses in medtech, fintech, and blockchain which was pretty unique. Learning in Manhattan was a huge plus because it was a fantastic location in the middle of everything. I did 4-weeks of online prework, then Phase 1 of Byte Academy’s full stack program which was 5 weeks in New York City. I only stayed for Phase 1 of the program because I wanted to focus on the back end and Python. Byte Academy’s money-back guarantee if you don’t land a job was also a win-win. Tell us about the Byte Academy application and interview process. It was a very professional process – I had two interviews with the admissions team. For an intensive bootcamp like Byte Academy, they were really looking for people who are focused, motivated, and willing to learn. They also want to see if you can learn new technical skills. Having motivation is key because you have to want to put the time in, be involved in different projects, and try new things. Since you are a current student at a university, what was your goal after graduating from Byte Academy? Since I attended Byte Academy in my second summer of university, I knew I would be looking for internships instead of full-time jobs. After Byte Academy, I applied to a lot of internships in technology. I want to make as much of a social impact as possible – the tech skills that I learned at Byte Academy was a great medium to enact that impact. How many people were in your cohort? Was your class diverse in terms of gender, race, life and career backgrounds? My cohort was fantastic because there were people from across the globe. There was a really broad range of career backgrounds – some of my classmates came from economics and math; another was the Head of Fintech Private Equity at JPMorgan, another was a professional chess player. I couldn’t think of a more diverse room. And it worked because everyone was really motivated to learn with each other. What was the learning experience like at your bootcamp — can you share a typical day? How much you want to put into the course is up to you. The Instructors were there very early if you wanted to take advantage of working with them, but I usually got to the classroom around 9am and left around 8pm. In the mornings, instructors gave us a syllabus for the day with three or four projects to complete. Sometimes they would give us a brief on how to work on the projects, and sometimes they would let us figure it out and solve the problems on our own. We would then work with our teams and the instructors would come around to help with anything specific that we may be stuck on. I thought the ratio of instructors to students was good because anyone could get help when you needed it. I do think it may be counterproductive to have too many instructors because you could get too reliant on their knowledge. So it’s important to keep trying and to be somewhat self-sufficient by finding resources online – you’re not always going to have an instructor there to help you. Later in the day, there may be a lecture where an instructor teaches a topic, but overall Byte Academy was extremely project-based. Projects were super exciting and the days went by quickly. At night they hosted career events, mock interviews, industry speakers, and group activities – Byte Academy’s meetup group had a lot of vibrant events. Being in New York City as an international student, there were so many opportunities to get connected to industry professionals when attending Byte Academy. Did you notice a difference in teaching style between Byte Academy and your university experience? Byte Academy’s teaching style was infinitely better. At my university there’s about 250 of us in my math classroom, so the lecturers don’t have much time for individual students. The course is very passive in that it’s theoretical and just about absorbing information – you don’t know how the material will be applied in a real-world context. I’ve done programming courses at my university where you learn the raw concepts, but not how they’re applied. Ultimately, I think there’s so much more benefit from starting with end outcome and then learning the information needed to get to that outcome. If I know this algorithm will allow me to do X,Y, and Z, and these are the real applications and companies that use it, and this is the impact it has on society, then I’m much more motivated to learn. And that’s the structure of Byte Academy. You’re constantly motivated to keep trying and to succeed in the bootcamp because you’re creating useful projects and seeing real-life applications. Byte Academy focused on providing really interesting and valuable projects. Even from an early stage when you don’t have a lot of background in programming, Byte Academy finds projects for you to work on with a basic level of understanding. Byte Academy was so much more practical and fun than university – I’m a big advocate of what they do. What was your favorite project that you built at Byte Academy? One of the projects I really enjoyed was creating the virtual trading platform. It was a full stack project – we worked on the front end and the back end using SQL. It was fully comprehensive and the first complete software that I’ve created. There are a lot of platforms that allow you to trade with virtual money, so I was specifically trying to build a cryptocurrency trading platform. What I enjoyed about this project is that it allowed me to use so many useful skills that were relevant for future projects. 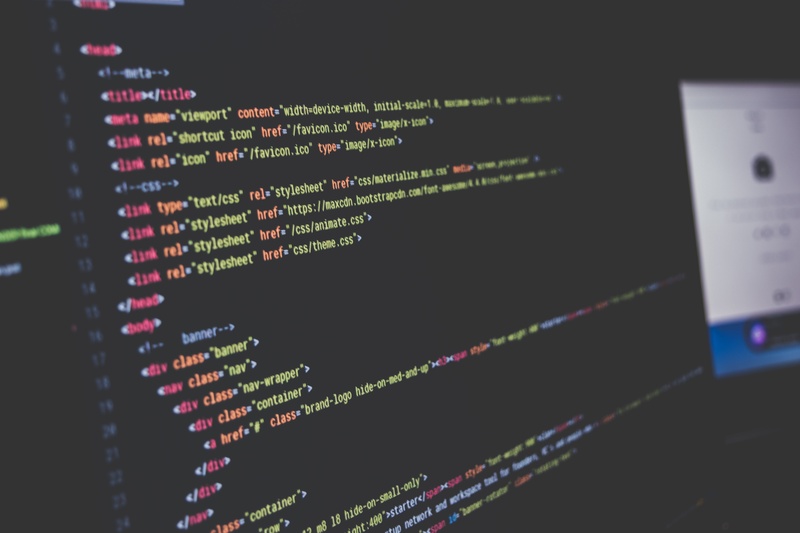 It was the first time I used API’s and web scraping etc – and in general, I learned key skills that were essential for my future career. We worked on a team – it felt like a Hackathon because we had three days to create it. It resembled a real professional team, where we all had specific tasks for a larger project, and then we came together to make something great. Byte Academy also constantly pushed us – we were encouraged to create new features and widgets on the trading platform to make it better. So the bootcamp pushes you to gain new skills throughout the course. This project was focused on SQL, and that actually helped me in my interview with Facebook because they specifically asked for a portfolio project using SQL. Tell us about the interview process with Facebook! How did you land the job? .I decided to apply to their Data Science Internship role. When I applied, I wasn’t expecting anything after submitting my application because data science at Facebook is extremely competitive. But my motto is you should try everything, no matter what, because you have nothing to lose. I got an email from the Facebook team that they thought my CV was interesting and they wanted to interview. I went all out to study as much as I could. I had a one hour interview talking about myself, what I’ve done, and what I’m interested in. Coming in with backgrounds in finance, fintech, fashion, and my Byte Academy skills – I think that breadth of experiences and skills was a big attraction. Facebook wants to hire really unique people with varied backgrounds. They also wanted to see my technical projects from Byte Academy. How did Byte Academy prepare you for the internship search? Byte Academy has an in-house admissions team, where they have great connections to New York City employers. They introduced me to the team at Google in London, and I was actually able to host a Google London Dev Fest at my university and produce an event in partnership with Byte Academy and Google. These were amazing opportunities where I met fantastic people. Even though I was only there for Phase 1 of the program, Byte Academy gave me a lot of help on my CV once I moved back to London (over a 3-month period for the full course, the career development advice is really extensive). Also, Byte Academy’s CEO has great connections in the tech space to help you network. What will you be doing at the Facebook internship? First, I got to choose the city I wanted to work in – I chose London. In London, Facebook has a data science team called Protect & Care, which monitors anything negative on Facebook – suicide prevention, fake news, bullying etc. For me, these issues are important so it’s amazing to apply the technical skills that I was working so hard on to real-life, meaningful actions. This is a dream role for me, so it motivated me to work really hard in the other interview rounds. There was a creative round of interviews and a final day of technical interviews where I had to build a project in Python and SQL. I tried my hardest, and I was very proud of myself that I landed the internship starting at the end of June. Do you think you could have gotten this internship on your own, without Byte Academy? Definitely not. The Facebook team told me that a lot of applicants were specifically focused on working with AI and machine learning. I was interested in these topics, but coming from Byte Academy we learned Python and SQL and the more analytical side of data science as opposed to the more predictive side. There’s a lot more to data science than predictive algorithms, so the diversity of projects I worked on at Byte Academy and picking up those skills quickly was an advantage for me. What advice do you have for bootcampers looking for internships at top tech companies like Facebook? Be different. Talk about projects that make you stand out and figure out what will impress a company about you. Creating your Github is important as well. Be ambitious – approach companies and ask to work for free to build up your portfolio. Keep trying and show what you’ve got. And don’t be too focused on a niche topic, because you’re competing with hundreds of people. What advice do you have for people considering a coding bootcamp? Choose a bootcamp that has an interesting curriculum and will get you excited to wake up in the morning. Also, if a coding bootcamp doesn’t offer a program you’re interested in – let them know! 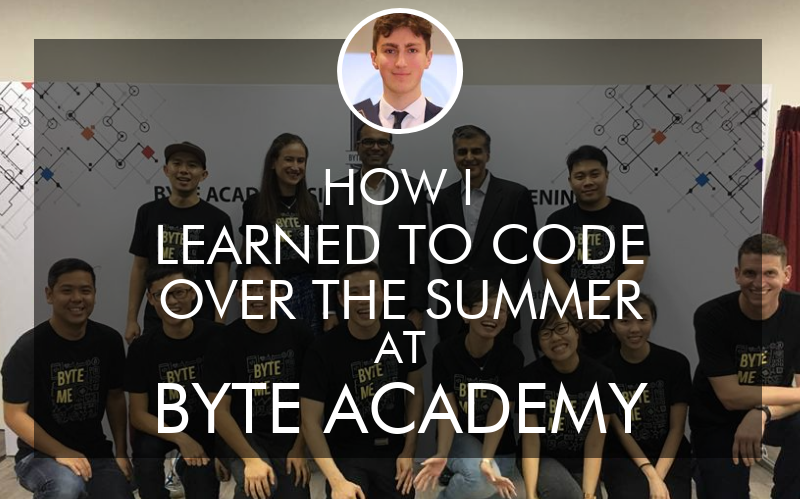 There was no summer program for university students at Byte Academy until I asked for one. Don’t be shy. Enjoy it! Read more Byte Academy reviews on Course Report and check out the Byte Academy website. Byte Academy ensures that students who work with career services are placed within six months of graduation (or receive their tuition back).